a sweet baby wrapped in a brown blanket laying on a blue throw. If babies half dressed don't do it for you, I don't know what does. This sweet baby was wide awake during the shoot. We decided to forgo trying to get him to sleep and instead work with what we had which was a very content baby ready to take photos. This guy had the pose down with his arm up to his cheek and a small smile for us. His brown hair went perfect with the blue throw and brown wrap we pulled together. I would always much rather have a sleeping baby but I am happy when I just get a happy awake baby. 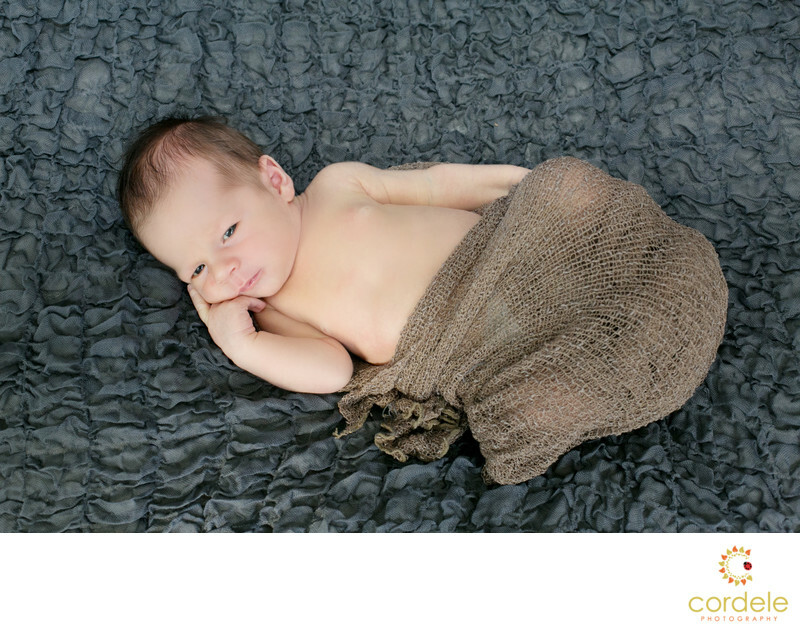 The couple came to my home studio in Reading and we put the baby on the baby bean bag and put the throw down and wrapped him up as tight as we could. He kept kicking out of it!